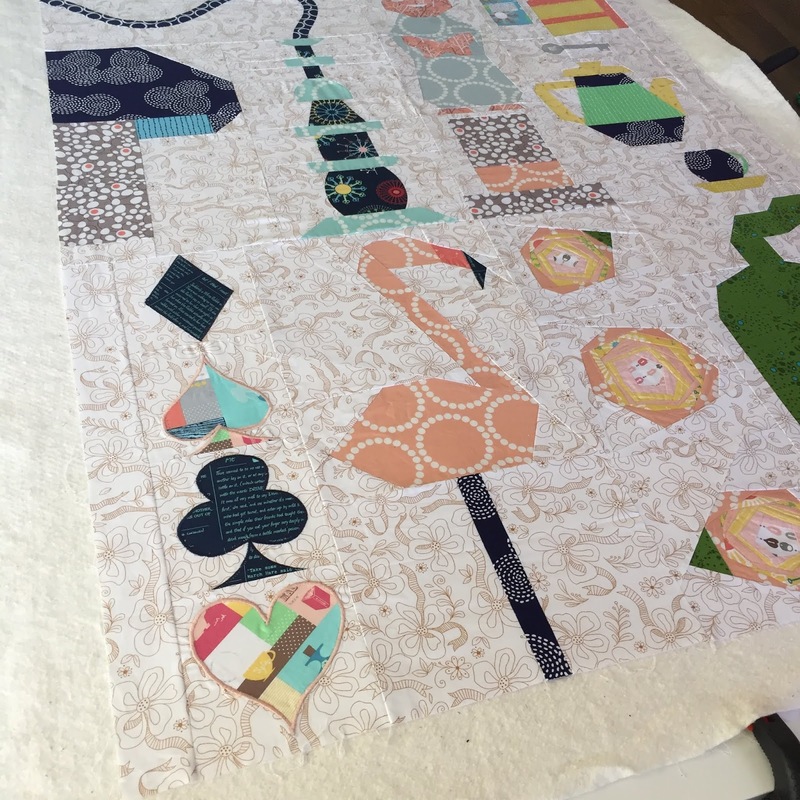 It's time to pull all our Wonderland Quilt Along blocks together. Grab the layout pattern. First it's a good idea to make sure your blocks haven't shrunk. Trying to stretch them as you piece your top together will make a lumpy, pleated situation later on, so it's best to add in a little now if things are coming up too short. Hookah Hose 20 1/2" x 8 1/2"
Mushroom: 10 1/2" x 20 1/2"
Hookah: 10 1/2" x 20 1/2"
Rabbit: 8 1/2" x 18 1/2"
Bottle: 4 1/2" x 10 1/2"
Cake: 6 1/2" x 10 1/2"
Key: 10 1/2" x 3 1/2"
Teapot: 10 1/2" x 10 1/2"
Teacup: 10 1/2" x 5 1/2"
Flamingo: 12 1/2" x 24 1/2"
Cheshire: 12 1/2" x 24 1/2"
It will be fun to see all the quilts coming together in the FB group! That looks really cute. Great colors too. Good advice from an experienced quilter. I've seen many people try to stretch blocks to "make them fit," with resulting disaster. Either cut them all down, or add spacers to enlarge. Looking good!